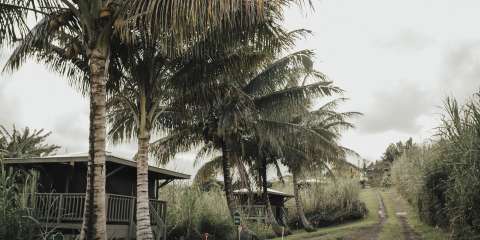 The Hamakua Camping Cabanas are located on the south end of Hawaii's breathtaking Hamakua Coast. Established in 2014 we are easily accessible to all the Big Island attractions such as Volcanoes National Park (1 hour South), Waipio Valley (1 hour North), and the countless sights and adventures along the Hamakua Coast, it is the perfect location to base your Big Island adventure vacation. The legendary Akaka Falls State Park is only 4 miles away from the Hamakua House. Onomea Bay is only 4 miles away, which is the home of the Hawaii Botanical Gardens. It is an unforgettable drive to get there and the bay is a wonderful place to have a picnic. We are only 1 mile (easily walkable) from the quaint main street of Honomu, HI. This town was established in the sugar cane plantation era and remains today boasting some wonderful gift shops, two restaurants, a coffee house, and the Island's best Zip Line Tours.